Web Guard is a program that enables you to find out what websites are monitoring you. As a result, you can either block the file collecting information about you or allow it to run on your computer. However, the fact that you are reading this report suggests that you want to remove Web Guard, so keep on reading to find out how to do it. The Web Guard program is advertised at thewebguard.com and is developed by Interesting Solutions. So far our researchers have found many programs that are very similar to Web Guard in terms of performance, distribution, and promotion. 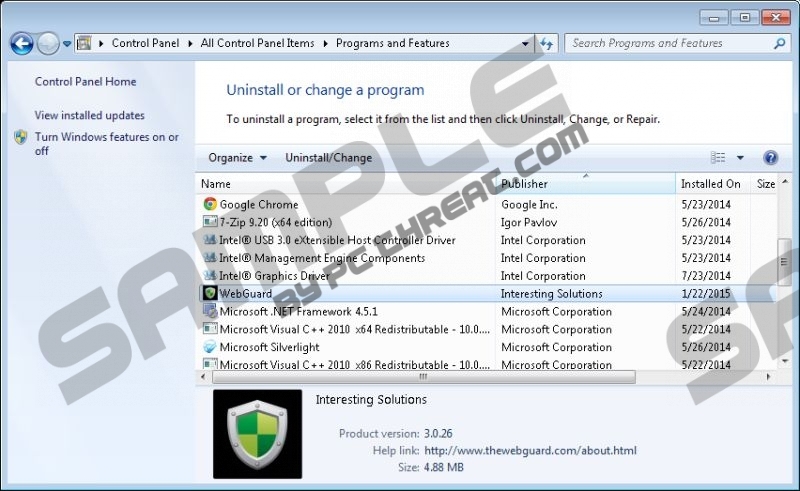 For example, Web Guard is based on the Injekt platform, which was used to create Web Shield, Zombie Alert, Zombie Invasion, Zombie News, and some other programs. These programs are claimed to be developed by different software creators, such Time Lapse Solutions and Creative Island Media, but it is believed that these are a single company using different names. All these programs, including Web Guard, create no browser extensions but run as separate services. Moreover, all of them are categorized as adware because they display third-party advertisements, which are supposed to enhance your browsing behavior. These third-party ads are claimed to be retrieved from high-quality ad providers, but we want to warn you that you should be very careful when interacting with such advertisements. Sometimes it is impossible to check the reliability of third parties, which may result in the display of some unreliable ads. Web Guard does not accept responsibility for the content displayed on the screen; hence, we recommend that you remove Web Guard from the computer as soon as you can. You should also bear in mind that Web Guard is interested in your browsing behavior, which means that some tracking techniques may be used to record your clicks, browser settings, and other non-personally identifiable information. People behind the Web Guard program declare that they want to enhance your experience with Web Guard. However, if you have no intention of using Web Guard and also want to get rid of Web Guard pop-ups, web banners, and other advertisements, you should not wait but remove the Web Guard program. Our removal guide below should help you uninstall Web Guard, but we recommend that you install a powerful security program. A reputable malware and spyware prevention program is especially helpful if you have no security program on your PC. There are many dangerous threats aimed at stealing your personal information or making some unauthorized changes in the operating system. The sooner you remove Web Guard, the sooner you can start browsing the Internet safely, so take action right now. Remove the Web Guard program. Uninstall the Web Guard program. If you want to be sure that Web Guard has been entirely removed from the PC, scan the computer. To do so, use the program available below and invest in it if need be. Quick & tested solution for Web Guard removal.